A little while ago, I started writing a large piece of fanfiction combining the Avengers and Pokémon. My favourite Avenger, Bruce Banner, has a Blissey he'd had from an egg, because her super HP and size would stand against the Hulk. She's turned into an OC all of her very own, this sassy, pink-and-ruffled knitting egg of doom, and has her own Twitter account - @grumpyruffles. So it is completely this pokémon's fault that this page exists. No regrets, nope! OMG I love this thing. Happiny is so so tiny and Bliss is so perfect and ARGH. I love it. 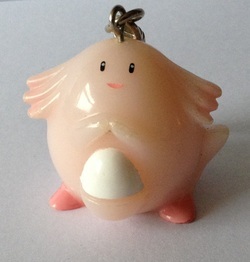 From the 2012 Charm promotion at the Pokécentre in Japan. I'm not sure what to do with my second Blissey just yet, but I'll come up with something I'm sure! 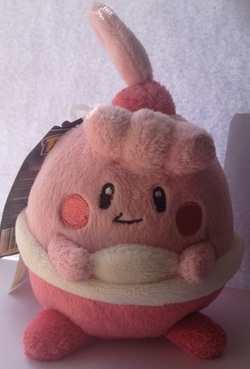 I dare you to say this isn't the cutest official plush ever. Two absolutely wonderful friends bought her for me, and she's super special because of that. I just... She is perfect! 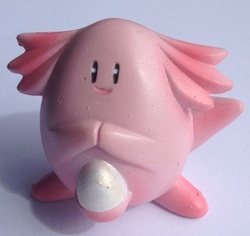 Made by the Pokemon Centre; Minky, 9 inches tall. Ittle little Happiny! 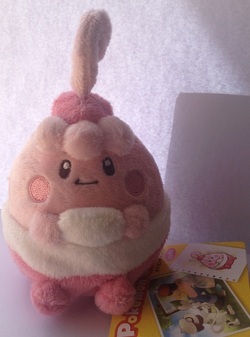 She's midsized between the Pokédoll and the Canvas plush below, and is also minky and super cute. 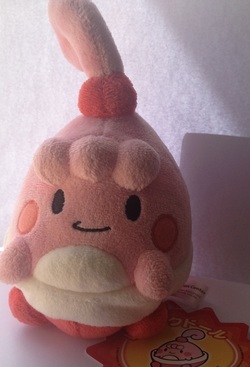 Made by Jakks Pacific: Minky, 6-7 inches tall. Happiny in the palm of your hand! A little, cute, pastel Happiny, from the Canvas range in I think 2008. 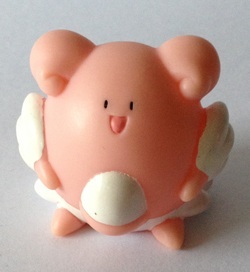 Made by the Pokemon Centre; Minky, 6 inches tall. 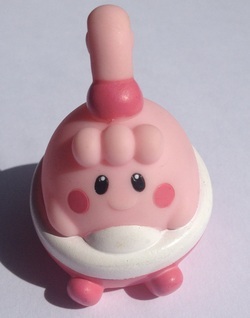 Cutest little figure! 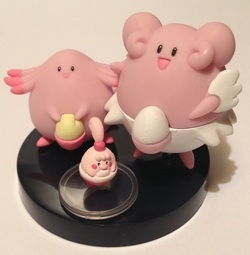 Kids are 2 inch hollow plastic figures, and as you can see, they're adorable! 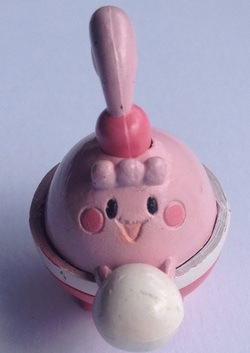 This is a solid, 1.5inch figure of Happiny, made by TOMY. She's so adorable! 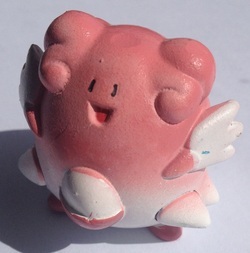 A 2 inch tall Kid figure of Chansey. She's so awesome. Oh this things little FACE! She's absolutely adorable, seriously, the cutest kid ever. 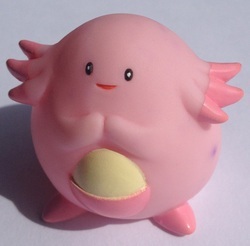 It's a glowing Chansey! She flashes with red light when activated. 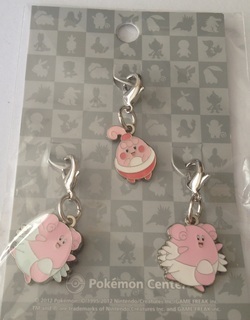 Some old school Pokémerch! 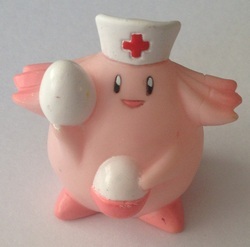 I'm not 100% sure what this Chansey figure is; she's a little bigger than the kids figures, and is metallic. Either way, she's very pretty! 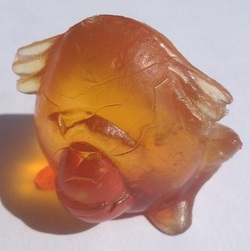 This orange figure is from a set of mysterious Mexican figures, featuring all of the first 151 pokemon I think. 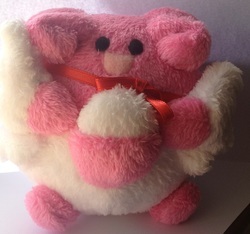 I cannot even begin to describe how much I love this plush. I fell in love with her when she was no more than a round ball, and she is so perfect. I adore her. She's better than an official plush; soft, well made, cute, all to scale, and a big booty, just like Bliss. Made by the supremely talented Sorjei. This pair of little ladies are about 4 inches tall from foot to ruffle, and are super soft and cute! They're very different, despite being from the same plush range and the same year, but both are awesome. Kids are 2inch high hollow figures made of light plastic. And this is the cutest one ever. THIS. OH MY GOD. Okay so on pkmncollectors we do Secret Valentine exchanges (ala Secret Santa but without all the post getting lost), and Gin (denkimouse.livejournal.com) was my valentine. AND SHE GOT ME THIS. 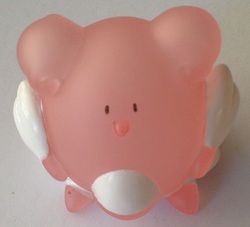 SSDUHAKJF SO CUTE OMG I didn't even know a clear Blissey existed and actually having one? Beyond awesome. As above, this was one of my Valentines gifts. AND IT'S SO ACCURATE. This is the face Bliss pulls when she throws eggs. It's her captured perfectly into a figure. 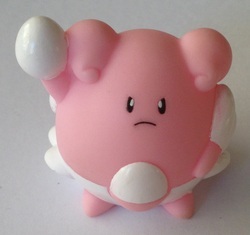 This is a solid, 1.5inch figure of Blissey, made by TOMY. She's so adorable!